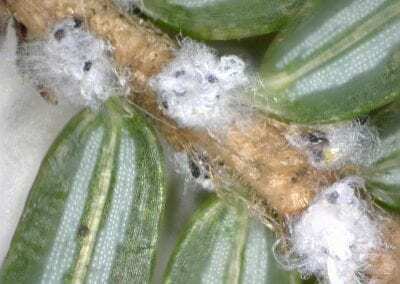 Hemlock woolly adelgid (ah-del-jid) (Adelges tsugae) is an invasive forest insect that poses a serious threat to the native forest and ornamental hemlock trees in the eastern United States. 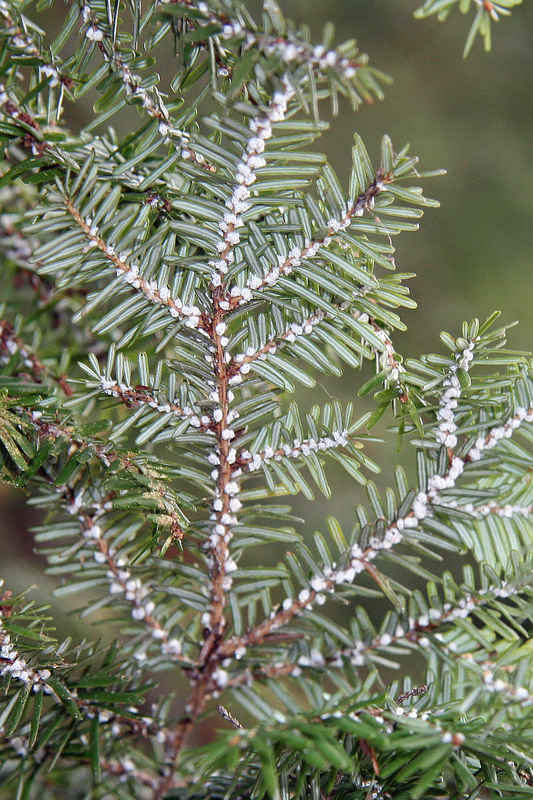 HWA came to the U.S. from southern Japan where it is a native hemlock pest. 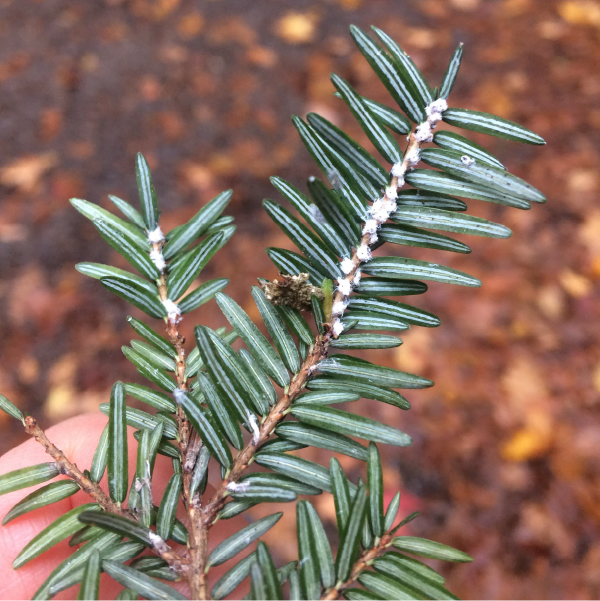 Of the known species of hemlocks worldwide, only the Eastern hemlock (Tsuga canadensis) and Carolina hemlock (Tsuga caroliniana) are at risk for fatal HWA infestations since the trees lack natural resistance and have no natural predators to manage HWA populations. In areas where HWA is native and there are a suite of HWA predators, hemlocks are adapted to living with HWA. HWA has been present in New York since the 1980s. 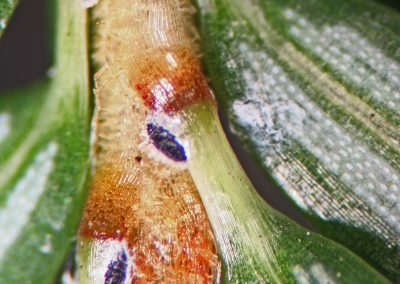 It most likely arrived in the state on infested nursery stock that was sold and distributed near New York City and the Lower Hudson region. 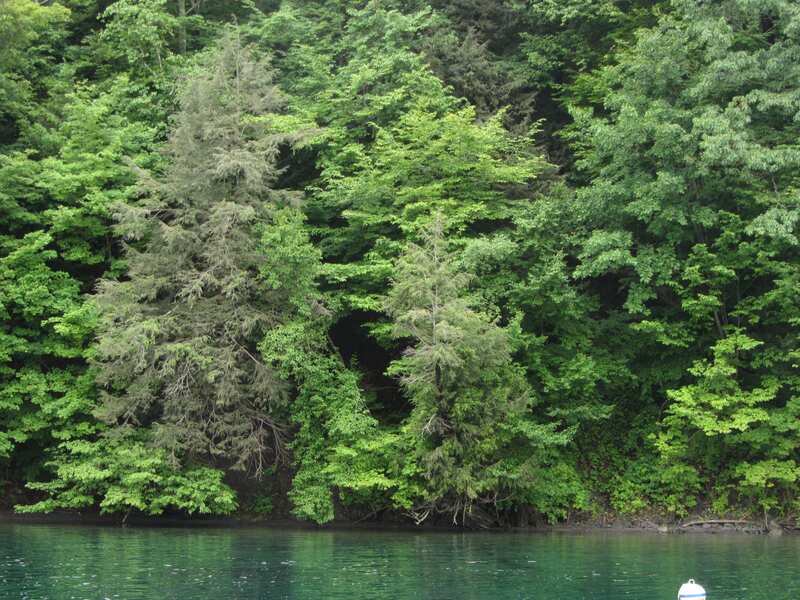 In 2008, HWA was found in the Finger Lakes. 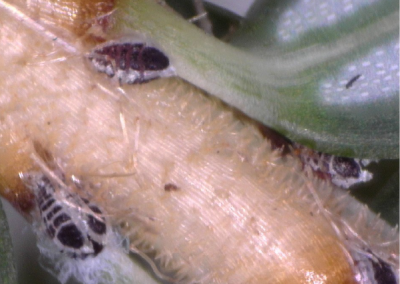 Infestations have also been found in more developed areas such as Syracuse, Rochester, and Buffalo, most likely as a result of the nursery trade. In 2017 HWA was confirmed in the Adirondacks near Lake George. 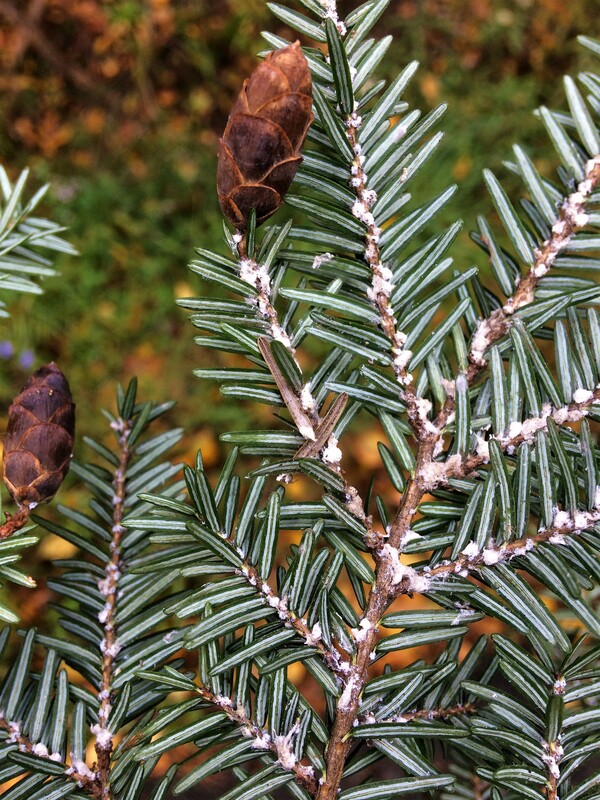 You can help limit the movement of HWA by treating any infested trees on your property and checking hemlock trees for HWA before making a nursery purchase. Left, Above: Webinars from Cornell’s ForestConnect program by NYS Hemlock Initiative’s Mark Whitmore. 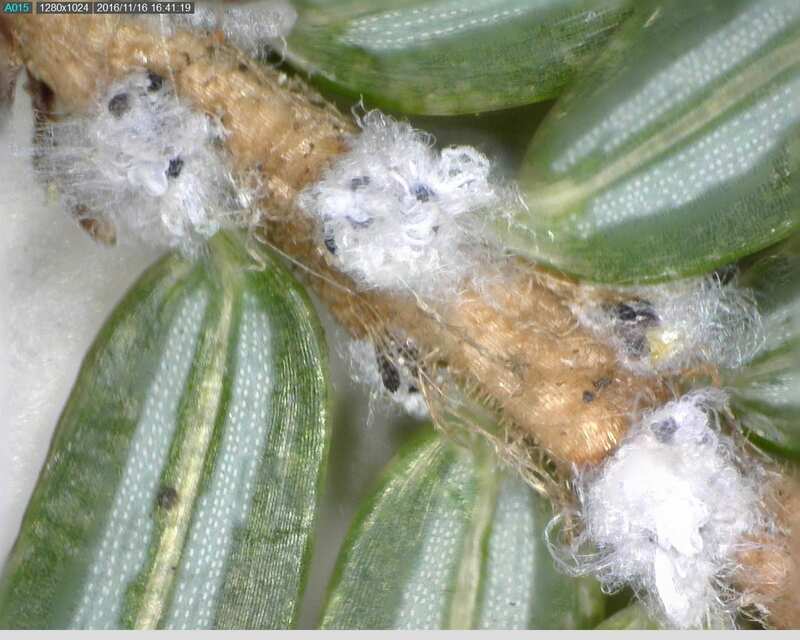 HWA is an aphid-like insect pest that feeds on hemlock trees with a piercing-sucking mouthpart. 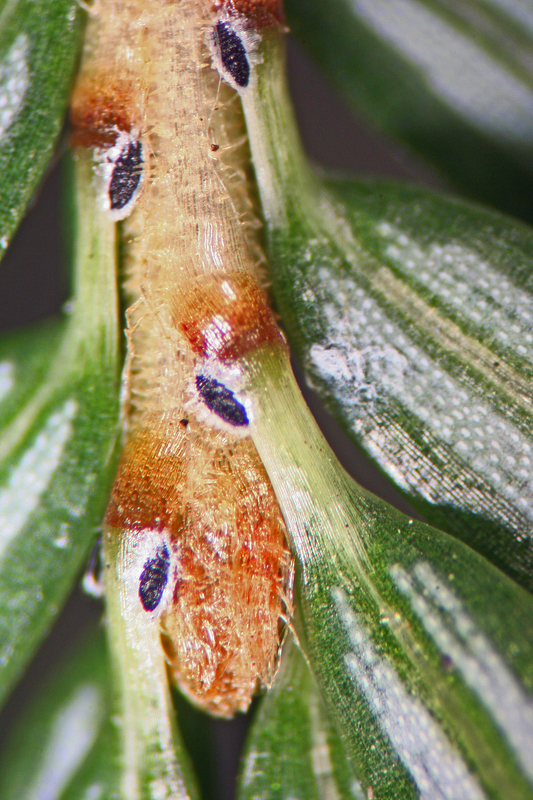 Adelgids feed on hemlocks by inserting their straw-like mouthparts directly into the twig. HWA feeds throughout the fall, winter, and spring when the tree is actively transpiring. While HWA is actively feeding and developing, it begins to accumulate the wool that gives it its name. The wool insulates HWA from cool winter temperatures and creates an ovisac in which to lay eggs during the spring. In the summer months HWA goes through a period of dormancy known as aestivation when its mouthpart has been inserted into the twig but HWA is not actively feeding or growing. Phenology is the study of the timing of major life cycle stages of an organism. HWA phenology is a complicated multistep process. 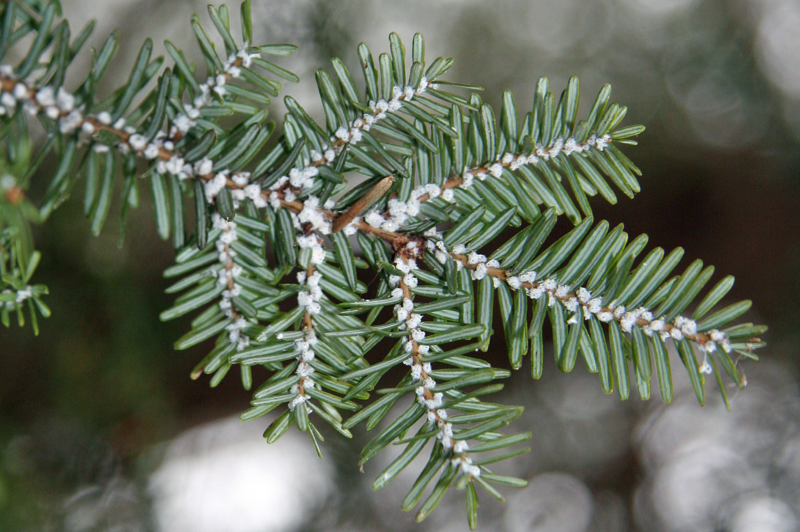 In the eastern US, HWA reproduces asexually and goes through two generations per year, both of which take place solely on hemlocks. You can learn more about HWA phenology on our HWA Phenology page. 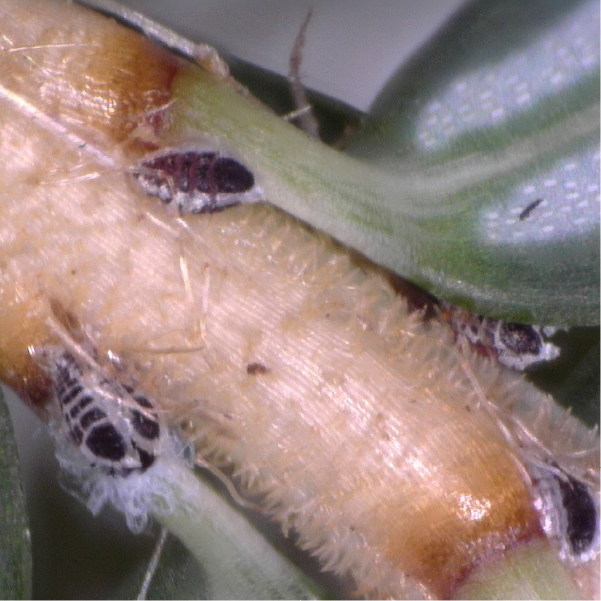 HWA under the dissecting scope, after a winter of wool growth. 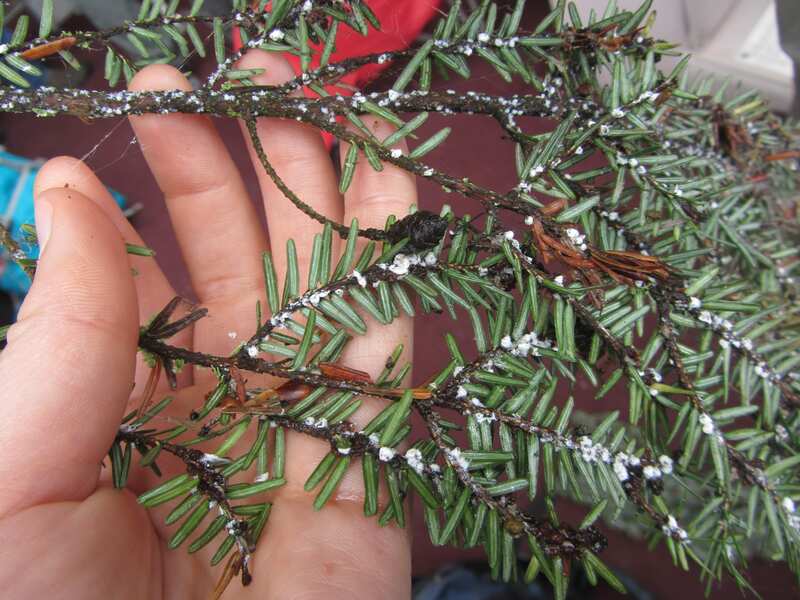 HWA can be spotted year-round, but it is easiest to see in the mid-fall through winter and spring when it is showing its characteristic small cotton-ball-like woolly masses on hemlock twigs near the base of the needles. In the summer months, HWA looks like tiny, black sesame seeds surrounded by a thin halo of white wool, located at the base of needles. 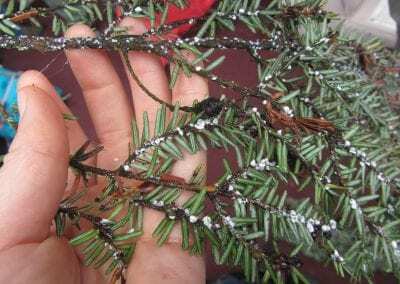 HWA damages hemlocks through its feeding mechanism. When HWA inserts its straw-like mouthparts into the twig, it creates a wound that the tree attempts to heal over. The tree’s attempt to heal its wound clogs the twig tissue, impeding the flow of water and nutrients to the ends of the twigs, killing the buds and preventing new growth. The tree eventually starves to death, unable to make new needles. 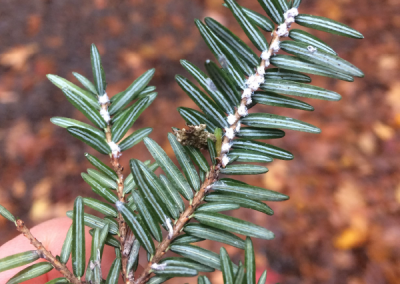 Needle loss from hemlock woolly adelgid often occurs years after the beginning of an infestation, so a lack of new buds in the late spring and early summer is a good clue for identifying HWA before heavy foliage loss sets in. 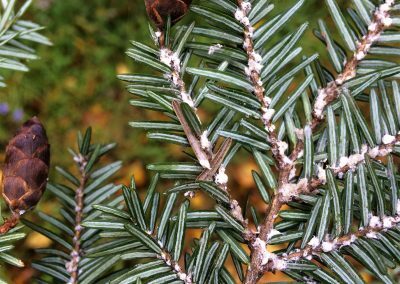 For more information on the threat that HWA poses to hemlock trees, you can watch this short documentary, shot and produced by filmmaker Chris Foito. The production of this film was supported by the Cayuga Lake Watershed Network.